With residential, office and even retail buildings going vertical due to limited land in many cities, the next step may be to do the same thing with light industrial projects. 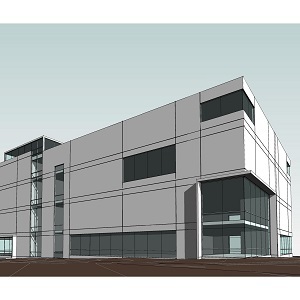 PC Urban is building a three-storey industrial building at 1055 Vernon Dr. in Vancouver. “We’re terribly excited about it and we’re all in, in terms of our commitment to trying to find better ways to respond to the lack of land here in Vancouver,” said Brent Sawchyn, principal of Vancouver-based PC Urban Properties Corp., regarding the company’s plan to build a three-storey, 105,000-square-foot industrial building on a former Able Auctions property at 1055 Vernon Dr. in the city’s east end Strathcona area. Sawchyn grew up in Winnipeg, where he recalled urban manufacturing taking place on the periphery of downtown in multi-floor brick buildings with freight elevators connecting various businesses. However, as many industries moved to the suburbs, where land cost less and was more plentiful, and thousands of manufacturing jobs were outsourced to other countries where labour was cheaper, these urban industrial buildings were largely torn down or converted to residential or office spaces. Sawchyn believes the pendulum may be swinging back the other way now, as there’s virtually no vacant industrial land left in Vancouver and land values are at an all-time high. With growing interest in technology-driven or craft-inspired manufacturing superseding the heavier and less clean industries of decades past, the time may be right for the likes of 3D printing, food processing, craft brewing and distribution businesses to be closer to where people live in the city. While both new construction and redeveloping existing buildings can play a role in this new model, Sawchyn believes starting from scratch is the best way to go. PC Urban’s Christopher Bozyk Architects-designed Vernon Drive property will have three 35,000-square-foot floorplates with 20-foot clearance heights stacked on top of each other. They’ll be serviced by five high-speed freight elevators and another high-capacity elevator for people and lighter freight. Large panel vans and trucks of up to five tons will be able to pick up and drop off goods, according to Sawchyn, who had been thinking about stacked industrial buildings for two years before PC Urban acquired the Vernon Drive property in January. A development permit is expected before the end of 2017 and the development is expected to break ground in January or February next year. It should be ready for occupancy in August or September 2019. No tenants have yet committed to the building. Sawchyn said it would be easy to accommodate specific tenant needs if requests are made early enough in the construction process. PC Urban has identified other potential sites for future densification projects.